I had this vision of presenting a big bowl of Cream of Tomato Soup with Basil Pesto & a side of Mozzarella Dunkers aka Baked Mozzarella Cheese Sticks. 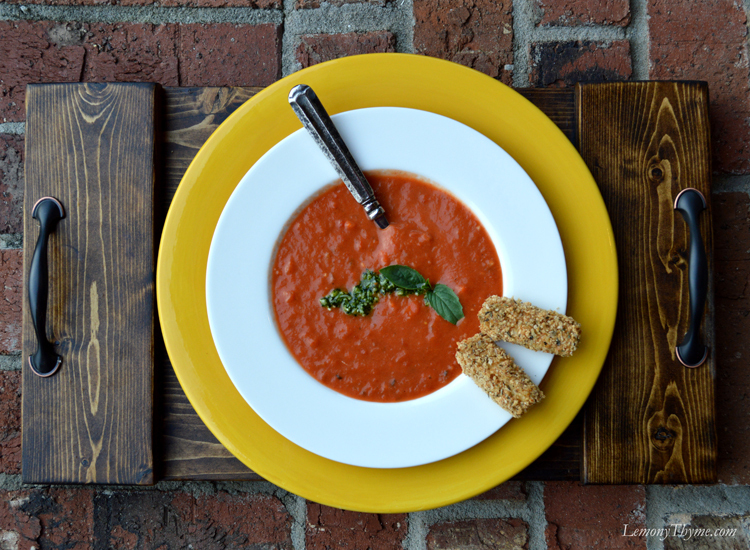 You know the scene, a gorgeous bowl of tomato soup with a side grilled cheese sandwich. One glimpse and you’re committed. The epitomy of comfort. It’s all about comfort in this house and I’m proud to say that we’ve learned to adapt to a lighter lifestyle. Our Baked Mozzarella Cheese Sticks start with Weight Watchers String Cheese. They’re just 1 Pts+ per cheese stick BEFORE you bread them. I decided to cut them in half so that after breading each piece is still just 1 WW Pts+. First thing to do is freeze your cheese sticks. This helps keep the cheese from oozing out during baking. Cut them in half, then roll them in flour, dunk in egg whites and coat in seasoned parmesan panko/Italian bread crumbs before baking. A little olive oil spray goes a long way towards achieving golden goodness. Being on a Healthy Choices eating plan doesn’t mean we can’t enjoy cheesy love. These Baked Mozzarella Cheese Sticks make a great appetizer and are fantastic dunked in Cream of Tomato Soup. Unwrap cheese sticks, cut in half and freeze (about one hour). Place oven rack to the top third position. Preheat oven to 400 degrees. Spread panko and Italian breadcrumbs on a shallow baking sheet and toast in oven for 5-8 minutes until golden brown. Remove from oven and transfer to shallow bowl to cool. Line baking sheet with foil and spray with olive oil spray. In a shallow bowl beat egg whites until foamy. Put flour in a second bowl. Combine toasted bread crumbs, parmesan cheese, basil and garlic powder in a third bowl. Coat frozen cheese sticks in flour, then dip into egg. Next roll in breadcrumb mixture until coated well. Place onto prepared foil lined baking sheet. Continue dipping each cheese stick, then lightly spray tops with olive oil spray. Bake for 5 minutes, then turn them over and coat with olive oil spray. Bake for an additional 5 minutes. Remove from oven and serve immediately.